You are looking at a one of a kind, hand made F-104 Starfighter inspired fuselage name panel. Ready for you to specify a rank, name and call-sign for me to professionally stencil (any font you like) and paint. My suggestion would be a 2’5″ tall matte black background on top, with the pilot’s rank, name and call sign painted in a period correct font in a matte white color. On a side note, what would YOUR call sign have been and what would your spouse think your call sign should be? I can also paint the top portion of the U.S. AIR FORCE lettering which was particularly large on that jet. Maybe just the top 1/4 of the letters. Your call. The panel measures 41″ long and 28.5″ tall. It sticks out a proper 6″ from the wall, to mimic the curve of a fuselage. 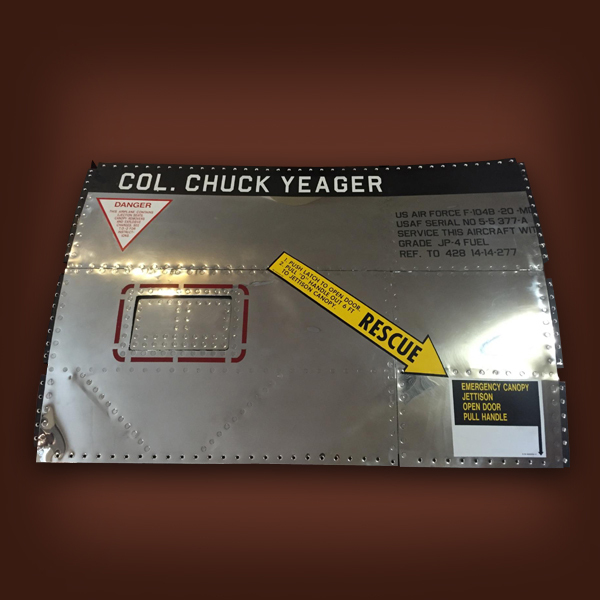 The panel is three pieces of hand polished 5052 series Aircraft Aluminum. Flush riveted with hundreds of solid aircraft rivets. Behind the panel you will see three curved and angled fuselage spars, complete with lightening holes. You will also see Longerons of angle aluminum, Some countersunk rivet holes have been drilled out to make the panel look as if it was removed from an aircraft. The panel features a flush mounted, spring loaded pilot’s step. Just push on the little door, and it opens into the fuselage for the pilot to step up and into the aircraft, then springs back closed as soon as the foot pulls out. I would be more than happy to paint some 3/4″ stenciled red lines around the door as there would have been back then. The panel has some gaps, which are meant to represent an aircraft that was built way back in the 1958-1969 era of the early ‘pointy nose’ jet age, and has seen it’s share of fuselage stresses and punishment. The three RESCUE, Ejection Seat and Rescue opening instruction stickers are New Old Stock, from that era and surprisingly have great adhesive. They are taped down for the photos, so you or I can mount them wherever you like. Of course these jets were made famous by the brave fighter pilots like Check Yeager and all of the ‘The Right Stuff’ era NASA Astronauts who regularly trained and came from this era of fighter jets. I would be more than happy to add some hydraulic lines, air lines, wiring, etc to give the back of the panel additional realism. This is not really a Man Cave item, more of a high-art, museum piece. If there is anything else you would like me to build for you, I would be happy to. I have made the world’s only hand made Ejection Seat Office Chair, Aluminum Skinned Electric Guitar, B-17 panels, rolling carry on suitcases, you name it, I’m either building it or planning on building it. You can check out NoseArtDisplays dot com for more items or look at My Store here on eBay.